A complete reverse engineering workflow for users to wrap 3D scan data into accurate polygon meshes as well as NURBS surfaces. It delivers best-in-class point cloud processing and various mesh repair/editing tools. It also provides you automatic registration, inspection, volume calculation, and deviation measurement tools. Comprehensive editing tools: Boolean, offset, fillet, extrude, clip, fit curbs, etc. This video shows three workflows of triangulation in VRMesh: convert points to meshes directly for a super accuracy, or decimate points before triangulation for time-saving and a good accuracy, or extract a region of interest to work on. This video shows VRMesh can convert vertex colors to a texture. 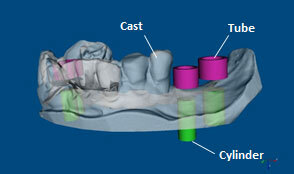 * Here is a 3D PDF document created by PDF3D ReportGen from Visual Technology Services (www.pdf3d.com). Please right-click "Save as" to save and use Adobe Reader to open it. This video shows how to measure deviation between two surfaces at each cross-section, and how to export a measurement report to a PDF file. Example 1: This video shows how to mark concave and convex edges in an open-pit mine and how to extract massive breaklines on meshes. Example 2: This video shows interactive terrain design using VRMesh's digital clay tools. Example 3: This video shows how to quickly design an open-pit mine and calculate the volume in the mine. Example 1: This video shows how to take an accurate measurement of stockpile volume. Example 2: This video shows how to calculate the volume in an open-pit mine. Example 3: This video shows how to work on a target region and calculate the volume of a sand pile. 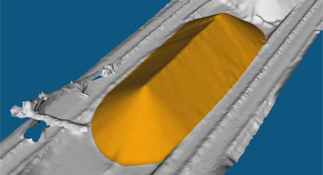 Example 4: This video shows volume calculation in mine surveying. Part 1: This video shows how to convert tank from a point cloud to a cleaned surface. Part 2: This video shows how to measure deviation between two surfaces at each location of cross-sections. Part 3: This video shows how to create a NURBS surface for simulation. Example 1: This video shows how to remove surplus objects and generate a clean tunnel surface. 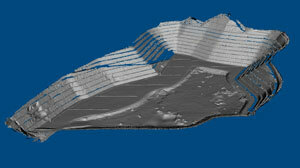 Highlighted tools include point cloud to mesh, surface extraction, gap filling, brush smoothing, etc. Example 2: This video shows how to calculate the surface area and volume of a tunnel, and how to compare the differences between a theoretical tunnel and an actual tunnel. 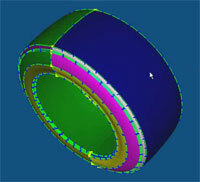 Example 3: This video shows how to generate tunnel cross sections. This video shows how to use a spline patch to fill big holes, and how to create a solid model for 3D printing. 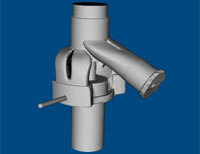 This video shows how to create a round pipe or a square pipe from point clouds. Example 1: This PDF tutorial shows how to generate triangle meshes and how to use mesh repair/editing tools to create a high-quality 3D model. 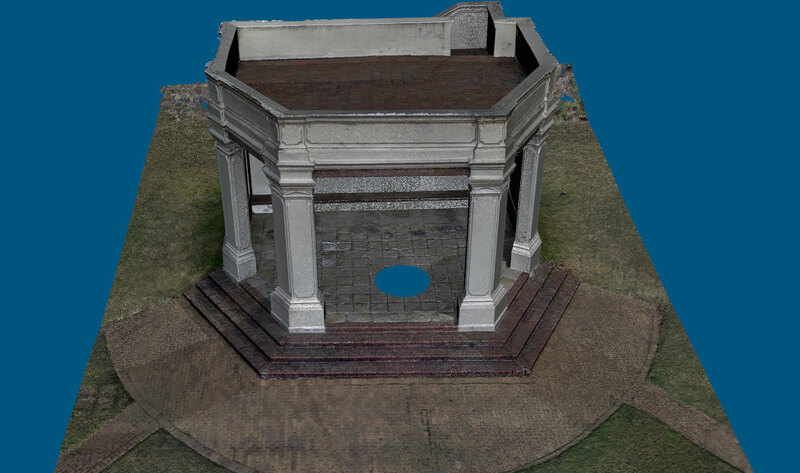 Example 2: This video demonstrates a workflow of converting large point clouds into accurate triangle meshes. It shows how to generate meshes block by block and finally seam them back into one. 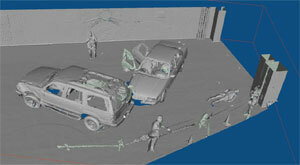 Example 3: This video shows how to convert point clouds to meshes for crime scene reconstruction. * Download the final triangle mesh here, including *obj and *stl files. 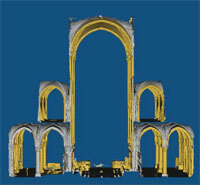 Example 4: This video shows the accurate triangulation of 88 million points for 3D modeling of Gothic architecture. * Data courtesy of Mr. Andrew Tallon, Mapping Gothic France - http://mappinggothic.org. Example 1: This video shows the enhanced workflow for streamlining the NURBS creation process. Example 2: This video shows how to repair meshes and create a NURBS car tire. Example 3: This video shows another example of mesh repair and NURBS creation. Example 1: This PDF tutorial will take you step-by-step through the general procedure of dental drill guide design. Example 2: This video shows a working example for generating a dental drill guide. 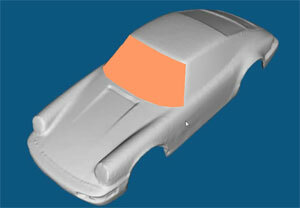 Example 3: This video shows how to merge objects into a watertight mesh for prototyping. This video shows how to extract ear canal and pinna from a scan data, and glue them together to design an earplug for 3D printing. This video shows automatic scan registration, and merging multiple patches into a seamless object.